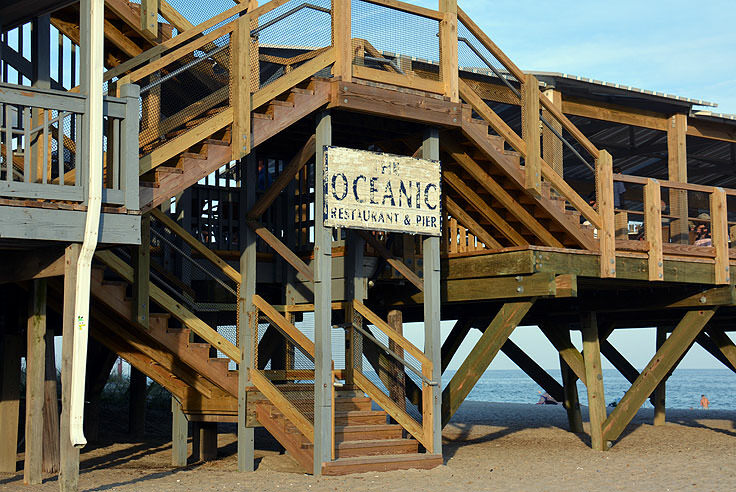 The Oceanic is the only oceanfront restaurant and pier on Wrightsville Beach, and as such, is a very popular spot for semi-casual lunches, refined dinners, and massive special events with an Atlantic backdrop. 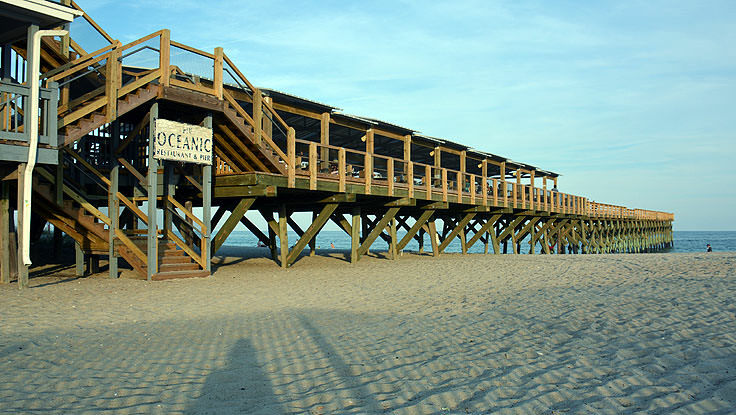 Attached to the Crystal Pier, which provides plenty of outdoor seating as well as a killer setting for seasonal live music, the Oceanic is a popular destination for visitors who simply can’t get enough of the beach. Most of the tables inside and out of the Oceanic boast picturesque ocean views, although diehard beach fans will want to find a shaded outdoor table for cool breezes and a panoramic vista. The lunch and dinner menus, as expected, pay homage to this oceanfront locale with a heavy focus on seafood, as well as a few classic “From the Land” entries, a nice selection of salads, and a host of appetizers for lighter appetites. For something refreshing, opt for the Miso Tuna Salad, the Wasabi Sesame-Crusted Ahi Tuna, or the Popcorn Shrimp Pita for a lunchtime entrée, and for a hearty dinner, opt for one of the seafood specialties like the Crab-Stuffed Shrimp or the Shellfish Fettuccini. With an unbeatable view, Oceanic is a must-stop for Wrightsville Beach vacationers who simply can’t get enough of the oceanfront. The Oceanic Pier may be better remembered by experienced Wrightsville Beach visitors with a long memory as the "Crystal Pier," and newcomers and old-timers alike will be delighted to learn that this historic structure is on the road to returning to its grandiose roots. Currently home to the renowned Oceanic Restaurant, while the future of the pier looks undeniably bright, the site can still be enjoyed as an incredible waterfront dining experience that's hard to beat, and hard to replicate, along the Wrightsville Beach shoreline. The original Oceanic Pier was constructed in 1939, during the resort town of Wrightsville Beach's heyday, and was an instant success. Just one year after opening for business, a Greek immigrant named Mike Zezefellis began the tradition of serving waterfront meals at the site, after he purchased the pier from the Hutaff family. The restaurant adjacent to the pier became an alluring tourist attraction in the decades that followed, serving up fresh crab cakes, locally caught seafood, and standard American beach fare, like hot dogs and burgers, to waves of Wrightsville Beach visitors. Eventually, the structure would change hands as older managers and owners retired, finally becoming the iconic restaurant, the Oceanic, which is found at the pier's entrance today. With the new name and ownership came broad changes, and the ramshackle dining area and pier house, (which always served as the hub of the restaurant), was expanded, remodeled, and turned into a more elite dining area that could accommodate more patron, in a more comfortable environment. While at this point the pier was used solely for dining and special events, such as weddings, the town was nonetheless devastated when a wave of 1990s and early 2000s hurricanes caused unrelenting damage to the original Crystal Pier. As a result, the pier's condition deteriorated at a steady rate, losing planks and pilings, and eventually being deemed "unsafe" by structural engineers in the early 2010s. Thankfully, the owners of the Oceanic, (AKA LM Restaurants), decided to take action, and started a long-term plan to rebuild the pier, extend the waterfront dining area, and even include a small fishing area at the end of the historic pier that would be open to the public. Renovations began in January of 2013, and visitors can expect to enjoy these changes in action on their next summertime visit. The all-wood pier is fairly easy to spot, and is located on the southern side of the island, near a collection of surf shops, vacation rental homes, and small coastal resorts. The restaurant is still the highlight of the scene, and features exceptional dining with an incredible view, which includes both indoor and seasonally outdoor available seating. Oceanic features daily lunch and dinner service, with diverse menus that honor the abundance of of fresh seafood in the area, while still paying tribute to its classic American fare roots. Lunch selections include a variety of fresh sandwiches, baskets, and lunch-portioned entrees, while dinner highlights include fresh seafood platters with flounder, oysters, and shrimp, seafood paellas, and even coastal Carolina staples like shrimp and grits. Meat lovers and vegetarians are also not forgotten, and the restaurant serves a wide range of signature cocktails, draft and bottled beers, and wine. Oceanic Restaurant also hosts a regular Sunday brunch, with a wide selection of coastal-inspired breakfast selections, in addition to live music in the summer months, (generally held on Thursday and Saturday evenings.) Summertime visitors can visit the Oceanic's website at http://www.oceanicrestaurant.com/ for a complete musical line-up. Private special events, such as grand rehearsal dinners, receptions, or even waterfront weddings, are also allowed at the Oceanic, and potential brides and grooms can call the Events Manager at 910.599.1337 for more information on planning an intricate, and customized, special occasion. 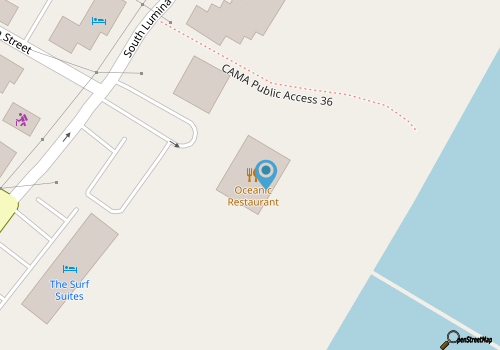 The Oceanic Restaurant and Pier is a famed historic attraction with a brand new look, although it caters to modern diners and vacationers just as well as it always has, with a varied menu and some of the most incredible waterfront views along the beach. For a delectable meal or a special event that goes hand-in-hand with miles of blue Atlantic Ocean waters, the dining experience at Wrightsville Beach's famed Oceanic Restaurant and Pier simply can't be beat. Call 910-256-5551 for current hours.